Can I use Nasodren if I have Polyps? Sinusitis is the inflammation of the sinuses. Inflammation leads to ostium (the opening that communicate the sinuses with nasal cavity) obstruction and cilia (small hairs that line the sinuses and function to remove mucus from the sinuses) impairment. When it happens mucus are stagnated in the sinuses and sinusitis symptoms appear. If mucus stagnated in the sinuses are infected we have sinus infection. So, not all sinusitis sufferers have infection but all have inflammation, the starting point in this vicious circle of rhinosinusitis (inflammation favors infection and infection favors more inflammation). Activating the physiological defense mechanisms of the upper airways (increased mucus secretion, greater ciliary cleansing activity and increased arterial blood flow) that are impaired during rhinosinusitis helps to reduce and prevent inflammation and therefore decrease the number of exacerbations of chronic rhinosinusitis. 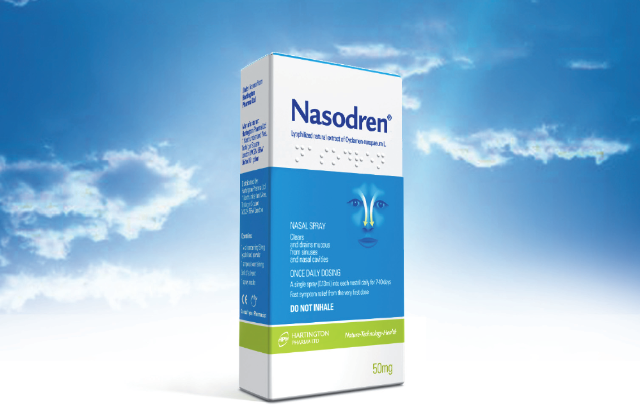 There is no contraindication in using Nasodren in case of polyps, but in case of huge polyps you will not fully benefit of it since nasal obstruction will remain. In case of very impaired quality of life, surgery is often the best, although sometimes polyps reaper. In case you want to avoid surgery, you should visit the ENT specialist who probably will recommend corticoesteroids to reduce inflammation. Nasodren can be used in combination with corticosteroids as well as with antibiotics (do not use concomitantly with decongestants because these reduce its efficacy). Surgery may sometimes be needed (when exist huge nasal polyps that obstruct the ostiu; in this case, mucus can’t be drained instead of using Nasodren) but it may not provide a permanent solution because polyps tend to recur.